Before going into the technical specifications and other rather important aspects of covert bullet resistant vests there is one thing I must say right at the beginning of my blog: To look after, or to be responsible for the personal security and safety of another human being and often members of their family is without question one of the very best and most rewarding professions one can be part of. You are very privileged if this is your field, but please ensure you never neglect your very own personal safety whilst doing your job! How the right covert bullet resistant vest can affect your very own security? Your hopefully exceptional ability to collect and analyse all available and relevant information will make you be, or become one of the very best in your field… because you will be able not just to do an outstanding job in improving the personal security of your principal or dignitary, but also look after your own safety, as good intelligence will help you plan a few steps ahead and allow you to put effective ‘safety nets’ or contingency plans in place. However, the matter of fact is that sometimes things don’t go to plan. That’s exactly when you really have to think and act quickly, make crucial decisions, and rely on your operational experience and training and the gear you have invested in, prior to your assignment. A high performance covert bullet resistant vest must be part of this gear, and my comments here will hopefully provide you with sufficient information, allowing you to invest in the RIGHT and BEST POSSIBLE body armour for you, based on your most realistic operational duties, risks and threats. Covert bullet resistant vests are always designed as, and also called ‘soft body armour’. Very rarely do they feature front and rear pockets for additional hard trauma plates… that’s something you will only find in overtly worn body armour, primarily in use in conflict or hostile environments e.g. war zones, politically unrest countries as well as maritime security. Basically in environments where the realistic ballistic threat is greater than that of any handgun e.g. assault rifles, precision rifles, machine guns or modern personal defence weapon. Subject to their stated protection level, covert bullet resistant vests can offer excellent protection from even the most powerful handguns and ammunition. Tested and certified protection can be offered from .38 Special and 9mm Parabellum, to .44 Magnum and .45 Magnum rounds, as well as one of my personal favourite weapons, the Israel’s rather famous Uzi sub-machine gun with a pretty reliable 32 round magazine. Many countries around the world have their own ballistic protection standard. However, the best known and most respected one is known as National Institute of Justice (NIJ) standard. The current NIJ 0101.06 standard is recognised and respected all over the world, in comparison to the British, German or other standards, which in most cases are more dominant or relevant within homeland security services in their own country or region. Personally I wish there would be a single International Ballistic Protection Standard all body armour manufacturers have to comply with, allowing them to manufacture larger volume and offer them to government and homeland security agencies at a much better price, but I guess that’s a little too political for this blog. The fact of the matter remains… a single International Ballistic Protection Standard would make it MUCH easier for everyone to understand what exact protection level is the ‘right’ one for them. Looking at this most recognised ballistic standard NIJ, what would be the best possible protection level you should be looking for? Well, the answer is dead simple. I strongly suggest you go with the highest possible protection level for ‘soft’ concealable bullet resistant vests, which is the NIJ IIIA ballistic protection standard/level (NIJ Ballistic Resistance of Body Armour). I will get to weight and thickness issues in a few moments… but be assured they don’t need to be as thick and heavy anymore as they used to be. A NIJ Level IIIA tested and certified covert bullet resistant vest will guarantee you officially certified protection against very specific rounds from close range and handgun threats a body armour tested and certified to NIJ Level IIA and II will offer. Only a very few covert bullet resistant vests manufacturers have recently taken ‘safety’ even to a further advanced level and offer body armour with additional protection from an Eastern European sidearm, such as Tokarev Ball 7.62 x 25mm and Makarov 9 x 18mm, which is of great benefits to Personal Security Details operating in Eastern European countries or the Russian Federation, or those facing realistic threats origination from this region. PPSS Group have recently taken protection to another level all together by also testing their covert bullet resistant vests against Taser X26. Another thing I want to point out here is the risk of Far East manufactured body armour, especially those manufactured in China. I fully understand the financial pressure many of us are currently under, but when it comes to the purchase of a potentially lifesaving piece of equipment… please think at least twice! We just have to accept that a Rolex is more expensive than a cheap watch, a Rolls Royce is more expensive than a Skoda and a trip to Kaiteriteri Beach in New Zealand is more expensive than a trip to the local coast… unless you are one of the lucky ones to live close by. If a foreign body armour firm is creating marketing statements using terminologies such as ‘cheap’, ‘affordable’ ‘cost effective’… my head says they are targeting a different sector/market to the one you are proudly being part of. A tested and certified high performance body armour cannot and will not be cheap (and please be assured I am aware of the many ‘stories of failure’ of way too many sub-standard body armour), but there is no doubt it can make a long operational day in the heat less demanding and is more likely to save your life than a body armour we have no real idea on HOW and WHERE it has been made. Body armour technology, manufacturing capabilities and body armour design have evolved a lot over the past 10 years. Body armour worn by the police and other enforcement agencies in most countries weigh in excess of 5kg or even 6kg and are often thicker than 20 or even 25mm. Please let me assure you that this is totally unnecessary. It is a well-documented fact that such weight will lead to physical fatigue. Physical fatigue will lead to stress. Stress can lead to human errors. Human errors can lead to the death of innocent people. Many body armour manufacturers are now capable of developing body armour less than half of the above weight, using high performance materials such as DSM’s Dyneema® SB71 or SB51, Honeywell’s Gold Flex® and Gold Shield® are leading to a noticeable reduction and stress, fatigue and any other negative side effect. However… I am personally not a fan of body armour utilising Kevlar XP… but that’s my personal/professional opinion. I strongly feel that in case you are looking for a covert high performance bullet resistant vest, your body armour should certainly not weigh any more than 2.2kg in today’s day in age. Manufacturers have been competing hard in order to develop the lightest body armour in the world. They have pushed each other to completely new levels, hence concealable bullet resistant vests weighing less than 2.0kg are now on the market, offering extraordinary ballistic protection. We at PPSS Group have developed our CV2 High Performance Covert Bullet Resistant Vests around the operational requirements of those professionals who are in need for simply the very best out there… we KNOW it is the very best out there! What is ‘blunt forced trauma’? Blunt Force Trauma is the non-penetrating injury resulting from the rapid deformation of armours covering the body. The deformation of the surface of a body armour in contact with the body wall arises from the impact of a bullet or other projectile on its front face. The deformation is part of the energy absorbing process that captures the projectile. In extreme circumstances, the blunt force trauma may result in rupturing of internal organs, sever internal bleeding and death, even though the projectile has not penetrated the body armour. An escalation of the available energy of bullets and the desire of armour designers to minimise the weight and bulk of personal armour systems will increase the risk of blunt force trauma. Blunt trauma, blunt injury, non-penetrating trauma or blunt force trauma refers to physical trauma to a body part, either by impact, injury or physical attack. The latter is usually referred to as blunt force trauma. for this very reason covert bullet resistant vests need to be as thin as possible. Now this is not as easy as we all would like it to be. The reason behind is the extremely dangerous risk of blunt forced trauma injuries. All modern materials being used to manufacture bullet proof vests make it literately impossible for a ‘bullet’ to penetrate. The much higher risk is the risk of blunt trauma injuries. The thinner the body armour, the more attention the manufacturer must pay to protect the wearer from such injury. I am sure you don’t fancy to see your body armour stop the ‘bullet’… but die later on in hospital from internal bleeding or other internal injuries! The aspect of concealability (is this actually a proper word?) is of immense importance… for you personally anyway, but even more likely for your principal. Of course, there are a number of high profile musicians, actors and other type of artists out there, who get a real kick out of being surrounded by ‘hundreds’ of massive guys who look as if they could move mountains… but are in fact too big to react quickly. The type of principal/dignitary I had in my mind when writing this blog is the high profile business executive and political, religious or cultural leader, who are much more likely to want you to blend in and be more ‘unnoticeable’ to the public. You might even be required to adapt to their dress code, which can range from wearing just about anything starting from a suit and casual wear right up to golf clothing and other sort of training gear… so your covert bullet resistant vests really wants to be 100% CONCEALABLE! The fact is threats may occur and an assault might take place even when your principal is relaxed, surrounded by friends and colleagues… things sometimes happen… and we do not see them coming. 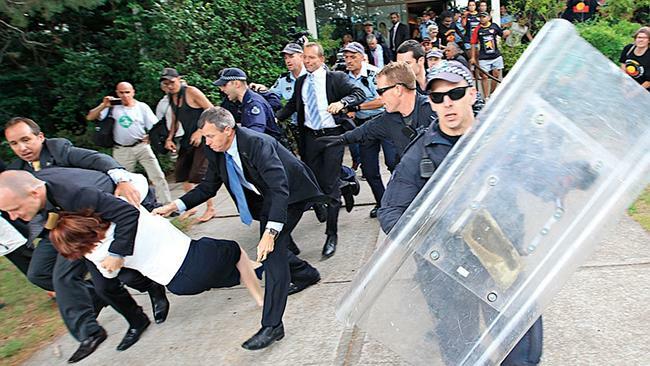 If the Close Protection Team of David Cameron (above) or the one which was responsible for the personal security of Australia’s Prime Minister Julia Gillard (2nd image) on the 26th January 2012 was wearing a bullet resistant vest on that day… we cannot see it… and neither can a potential assailant… and that’s exactly what you should be aiming for too. My strong personal advice: Do not draw unneeded attention to yourself! Please note good modern bullet resistant vests can be less than 10mm thin. In fact, some concealable high performance bullet resistant vests are as thin as 7mm and with the assistance and backing of specially designed trauma liner they still outperform existing body armour, which used to be heavy, bulky, thick and restrictive. Comfort is about how you feel when you wear your concealable bullet resistant vest. Weight, thickness and flexibility are three of the many aspects, which everyone should carefully consider before purchasing this type of protective equipment. The wearability (also unsure if this word actually exist) especially in hot and humid environments is also an important aspect. Please let me assure you that wearing a bullet resistant vest will always make you sweat. The question is just how much? In Middle Eastern countries, Australia, South America or Africa we have to accept the fact that temperatures can often exceed 40 degrees Celsius. For a Personal Security Details wearing a covert bullet resistant vest in such condition is a serious ‘burden’ and this professional must be able to get on with the tasks on hand without excessive body heat implications or severe risks of dehydration. Temperature regulating fabrics, such as Outlast® space technology (as used for all PPSS Bullet Resistant Vests), or moisture-wicking technical fabrics, such as Coolmax® are now being used as base layer for high performance bullet resistant vests, making them ideal for those Personal Security Details operating in hot and humid environments. I urge you to find out if your potential future body armour is offering this level of ‘luxury’ and comfort. As the CEO of PPSS Group (and as someone who has worn covert body armour in some rather challenging environments and circumstances) I can say that our bullet resistant vests have been trialled by, tested by and supplied to diplomatic protection units, special forces personnel, law enforcement officers and prison transport teams in countries around the world. We are not the largest body armour firm… but we strive to become the very very best on planet earth. It’s our passion… some may say our destiny! One of our best attributes is that we 100% understand terminologies such as ‘top secret’, ‘classified’ and ‘confidential’… we know there are some of our closest allies, associates and colleagues out there wearing our high performance bullet resistant vests… trusting our equipment… and you know what? They really can!!! Please feel free to comment on this blog. It would be a pleasure to hear from you!